Recently the Daily Mail in the UK published an article about China's ghost cities, which have been built inland, in often desolate places, and are vastly unpopulated. 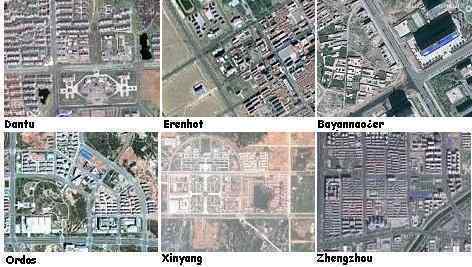 The rationale for these cities is not explained by the state, but Google images clearly show these are not merely housing complexes - these are cities! These amazing satellite images show sprawling cities built in remote parts of China that have been left completely abandoned, sometimes years after their construction. Elaborate public buildings and open spaces are completely unused, with the exception of a few government vehicles near communist authority offices. Some estimates put the number of empty homes at as many as 64 million, with up to 20 new cities being built every year in the country's vast swathes of free land. The photographs have emerged as a Chinese government think tank warns that the country's real estate bubble is getting worse, with property prices in major cities overvalued by as much as 70 per cent. 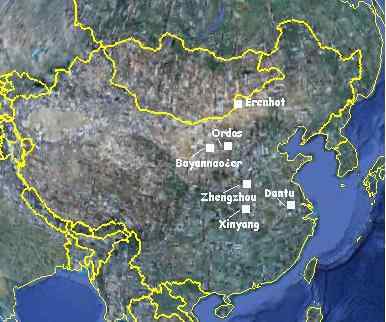 Note that the location of the ghost cities avoids the south China region warned by the Hangzhou UFO to be subject to a sinking coastline as part of the 7 of 10 sinking of the plate tongue holding Indonesia. The coastline warned of a 20 foot drop in sea level elevation stretched from Hangzhou south along the coastline to Vietnam. ZetaTalk Interpretation 7/10/2010: Hangzhou is on the line of breakage as the tongue of the Eurasian Plate is pulled down and under the Indo-Australian Plate. This is the line so active in sinkholes lately, from the point where the Himalayas are pushing into China across to the coast. 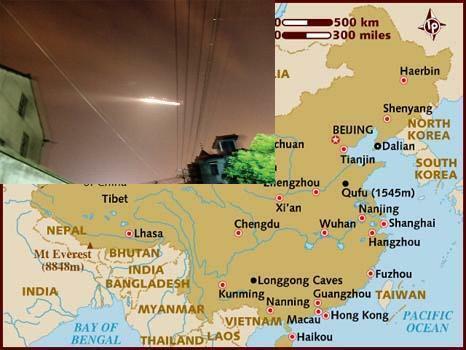 The UFO was reported, sighted, as far south as Guangxi and Guangdong provinces, which are likewise along the coastlines in the regions being drawn down as the tongue of the Eurasian Plate is being bent. These regions, and Hangzhou, are clearly being warned about tsunami and a suddenly rising sea level as the plate is bend and pulled down. The location of the ghost cities also avoid the sinkhole belt, which stretches from the Himalayas east to the coast, and per the Zetas represents the swath of land which is bending as the plate tongue holding Indonesia is pulled down. The ghost cities are also being built inland, away from what will be flooded coastlines after the pole shift, and in provinces far from India, which will be the new S Pole. ZetaTalk Prediction 5/22/2010: The highlands of the many provinces that lie between Mongolia and the coast of southern China will have a climate equivalent to southern Canada today. This allows Canada to grow grain and house herds of cattle. 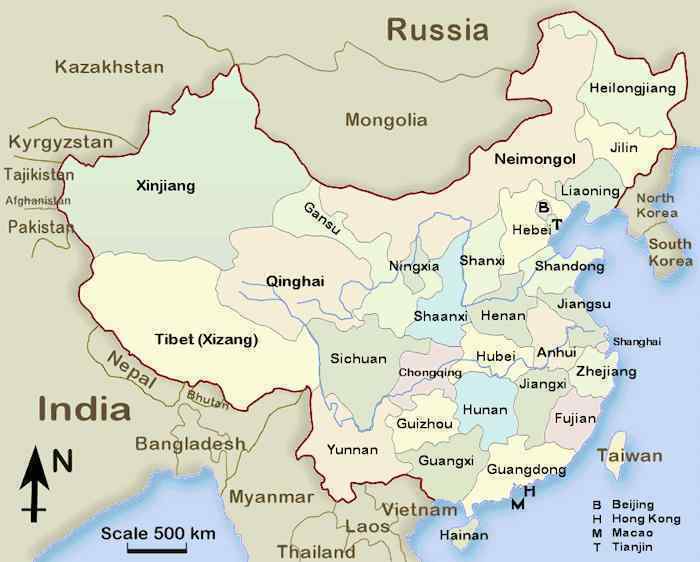 The highlands in the provinces, inland from the coast of southern China, will escape the punishing tidal waves. ZetaTalk Prediction 5/22/2010: Those above Beijing will find themselves hosting sputtering politicians, who will attempt to made demands and expecting subservience. Their climate will remain similar to today, however, so survivors will have less adaptation required. So what is the purpose of these new ghost cities, uninhabited to date and with NO explanation from the Chinese government as to their purpose. Per the Zetas, China is taking the ZetaTalk predictions seriously, and has for the past decades during which these cities were under construction! ZetaTalk Explanation 2/12/2011: Cities built within China are not a corporate effort, they are a state effort, as it is a communist government. These ghost cities would not be a mystery if they were corporate developments, as the corporation would be advertising residences for sale. Corporate developments also do not include government buildings, highways, and attention to infrastructure. Corporate developments build up around existing infrastructure, building subdivisions or resorts. Given that this is a state enterprise, why is China doing this? Per the Zetas the S America roll will be the second 7 of 10 scenario to occur, following closely on the heels of the sinking of the plate tongue holding Indonesia. Sinking in Indonesia continues apace, with flooding in new areas and deepening flooding in those areas affected early in the process, with flooding "from the sea" and "vicious waves" reported, but the sinking still has not reached the depth predicted by the Zetas. Per the Zetas, as explained in Issue 223, plate undulation has set in, causing these delays. Meanwhile, the rolling of the S American plate continues to tug. What has occurred in the region since we last reported in Issue 215 that the Panama Canal had been closed, on December 6, 2010, for the first time in its 125 year history? Panama is still soggy, and this is not draining. This per a brave report on the Pole Shift ning from someone with family in Panama. My wife is from Panama. I don't have any physical articles to present as evidence on the following comments. Panama is experiencing horrible flooding. The waters are not receding. They are blaming this on someone not opening the canal doors when it rained one time, but I don't think that is the cause. I have heard one theory that it could be the earth's plates that are rising below the country that will not allow the water to run off into the rivers and out into the ocean. The local news doesn't have much coverage of it. For instance my wife's family lives in Panama City and they only have potable water 1-2 days out of the week, the rest of the days they have to go without any water. It has been this way for over 3 weeks now. This information comes from my wife's family. I don't know how much of the rest of Panama is affected by this flooding. Note that the lack of potable water, reportedly for 3 weeks, coincides with the reported dates for the collapse of roads in and around Pamama in the article below. Clearly, sinking in this region has occurred around January 18, 2011. Cracks and subsidence, among other damage, continue to show several sections of track or Transístmica Roosevelt Boyd, from Colon to Panama and back, following heavy rains that have lashed the area since Dec. 8 and hit the road bases. The first collapse occurred on 15 November, but the rains continued to undermine the pavement until detach on 13 January. This has caused along the road that connects the cities of Panama and there are sections disabled, such as those listed above, and that drivers have to use a single piece. Meanwhile, as the hump of the S American Plate continues to slide over the Caribbean Plate north of Columbia, this does more than push Panama down. It creates mountain building along the N Andes Fault Line. A city with almost a million inhabitants was completely crumbled last December. This city had been in place since 1857, when it was established in the Colombian Andes. 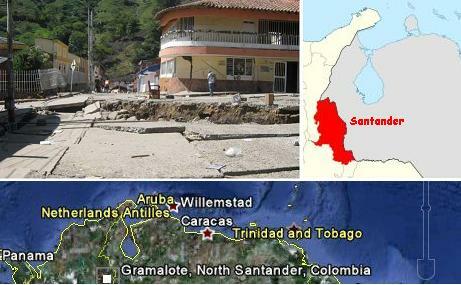 A Colombian village, Gramalote in North Santander, is being swallowed by the earth. The town will disappear in few hours. 90 percent of its population has been evacuated and rescue teams try to recover official and historical documents from government buildings. Gramalote is a municipality of 918,942 inhabitants. It was founded in 1857 on a geological fault of the Eastern ranges of the Colombian Andes. A hill that is next to the town, is falling on it. The crumbling action was described by the Zetas recently, in graphic terms, as people seemed to be discounting the seriousness of their prediction for Central America. ZetaTalk Description 12/11/2010: If total destruction does not occur during the 7 of 10, it will during the hour of the pole shift if not before that time. Panama and Costa Rica will be crushed during the 7 of 10 by the grinding movement of the hump as the great S American Plate grinds over it. Does this bring to mind a ride in a car with a bad set of shocks? The land before you will heave up, up to several hundred feet high, and tumble toward you. This is an example of what we mean by "crumbled". 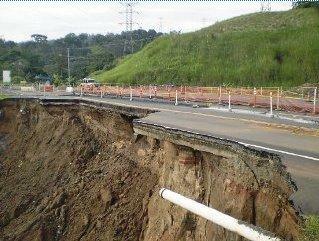 Landslides caused by rain and steep hillsides is not a preview of what to expect! The entire mountain may sheer off and slide into valleys, crushing not just a village or road but all civilization for dozens of miles in either direction, buried under so much rock that rescue is unthinkable. Valleys will simply fold, the mountain ranges coming together and squeezing all life out between them. Guatemala, El Salvador, Nicaragua, and Honduras hardly fare better, though the hump of S America does not grind over them. Rock strata torn apart is not local, but has a reach. They will crumple also, but to a lesser extent during the 7 of 10. Jakarta has been sinking, as noted on September 26, 2010 in Issue 204 of this newsletter. At that time, their canals had begun to crumble. News articles to that date indicated that sinking in Jakarta, due to pulling ground water up and the weight of heavy buildings, was expected to be a maximum of 10 cm/year, to a total of 40-60 cm by 2025. This was the projection in 2008 - an additional 18 inches by 2025. Presumably this was a situation that had gotten steadily worse as the city grew and the ground water consumed. A worsening problem. Per a recent article dated February 9, 2011, the sinking overall, between 1974-2010, was 4.1 meters! And another article, dated February 2, 2011, cites a danger of a tsunami breaching a sea wall putting parts of Jakarta under 6 meters of water! Suddenly, since the sinking of Java has begun, we are talking 4.1 and 6 meter subsidence! By 2025, estimates from the Intergovernmental Panel on Climate Change (IPCC) show, sea levels will have risen by only about five centimetres. But Mr Brinkman says Jakarta, which spans a flat plain between mountains and coast, will be between 40 and 60 centimetres lower than it is now. Decrease in land surface by 2010 had reached 4.1 meters. Jakarta Konsursium Coastal Defence Strategy (JCDS) Public Works Department hopes to follow up the results of the study land subsidence affecting the falling number of roads and bridges in Jakarta. In the period 1974-2010 has been a decline in surface soil in the Jakarta area and 4.1 meters. The decrease in surface soil in Jakarta, occurred between 5-10 inches each year. In a preparatory study for manufacturing giant dikes in North Jakarta, JCDS team found that a number of bridges have collapsed as part land subsidence, or land subsidence. Suddenly, Jakarta is worried about the sea breaching its sea walls, to cause new flooding inland to a depth of 6 meters! This is in Jakarta general, which is on average 23 feet above sea level. Have we had sinking, in the Jakarta region such that sea water can overtop land barriers and inundate low areas to a dept of 18 feet? Is this in addition to the 23 feet above sea level, the average for Jakarta? Certainly it is of record that the island of Java's north coast has recently experienced at least a 20 foot drop. Should the land be flooded by seawater, the land may subside by up to six meters. Minor tsunamis may take place. 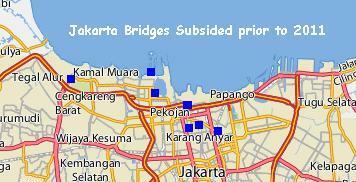 Pasar Ikan floodgate in North Jakarta has been infiltrated by seawaters by 2 meters in height. Meanwhile, sinking continues in Indonesia and the other countries housed on the plate tongue holding Indonesia. This past week has been relatively quiescent in that regard as the magma sloshed into the north Pacific, and was not lifting the eastern end of the Indo-Australian Plate nor the curve under Sumatra and Java. But as of February 10, this changed. Another sinking session is anticipated. But even without the lift to encourage sinking, sinking has occurred. 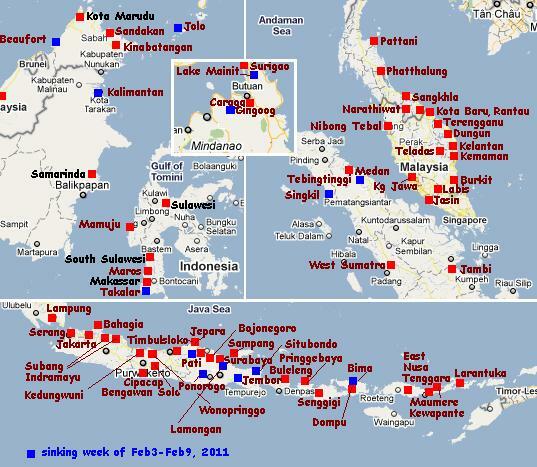 The dark blue locations are new during the past week, since February 3, 2011, as indicated in these news articles. Some of the first locations to sink in late December are being revisited, with deepening sinking. There are revelations that rivers cannot drain the waters, flooding is from the sea, choppy waters capsizing boats, and vicious waves come inland. At no time are storms reported. One of the regions to sink recently was Jolo, on the island of Sulu near northern Borneo, where 10 feet in elevation was suddenly lost in the middle of the night. This was blamed on a tornado, though high winds were not in any reports. Very telling in official admission is the need for a desalination device so the people will have potable water. The water is from the sea! Filipino leader Benigno Aquino III flew to flood-ravaged southern Philippine town of Jolo where he distributed relief goods to thousands of victims. Aquino also said he would ask the Manila Waterworks and Sewerage System to urge the two water concessionaires of Metro Manila to help or assist in desalinating the murky water of the province to ensure that flood victims can continue enjoying potable water. The squeeze is on, with the plate tongue holding Indonesia collapsing like an accordion and being pushed under the curve under Sumatra and Java, causing the countries housed on the plate tongue to sink. The Burma Plate is rising and the Indo-Australian Plate has tilted so that Pakistan has lost elevation while Sri Lanka is being flooded along its eastern coastline. The squeeze is on! What does this do to the continent of India, caught in the midst of this? Central India has developed tar pits! As noted in the press and on the Pole Shift ning recently. There is a district in the State of Andhra Pradesh, India, called Anantpur where residents of that district observed the earth developing deep cracks, almost like the scene in the movie, "Tremors." From those cracks, smoke is emanating with lava like material oozing out. In other places, (in the same district) upon digging the earth, people found hardened, black stone or earth crust charred to a cinder but firm to the touch. There is no volcano in and around the area so it is pretty strange that lava like substance can be found. A few days later as on Feb/6/2011, in Krishna district, also in Andhra Pradesh, a man was getting a bore well dug up and found to his surprise hot water like a geyser, bubbling on the surface. Geologists dismiss this in their usual brusque manner as something that happens when there is an earthquake and that the place experienced some tremors some time ago, which is not true. Is there a cover up? Why is the Government not going deep into the matter? These are some of the questions that crop up in one's mind when one takes the overall scene of what is going on in the rest of the world. In a strange phenomenon, a black chemical substance gushed out from the earth, creating panic in Maddikera village in Kurnool district. Huge cavities also formed. The nearby grass caught fire when the black substance spread like lava from a volcano. A cement electric pole in the vicinity collapsed. Per the Zetas, it's just the squeeze. ZetaTalk Explanation 2/12/2011: Certainly, the rock strata beneath India is feeling the squeeze, and in such cases the weak point breaks. Up comes something long buried. Oil comes in many forms - gaseous, liquid, or tar. In this case, a tar bed has been breached, and is bubbling to the surface during the squeeze.